Operated on behalf of Warrington by community interest company LiveWire, the £16m facility, now partially open (March 2018), will offer floodlit tennis courts and football pitch, swimming pool, sports hall, fitness studios, NHS health suite, conference facilities, concourse with food outlets – and a library and library terrace. 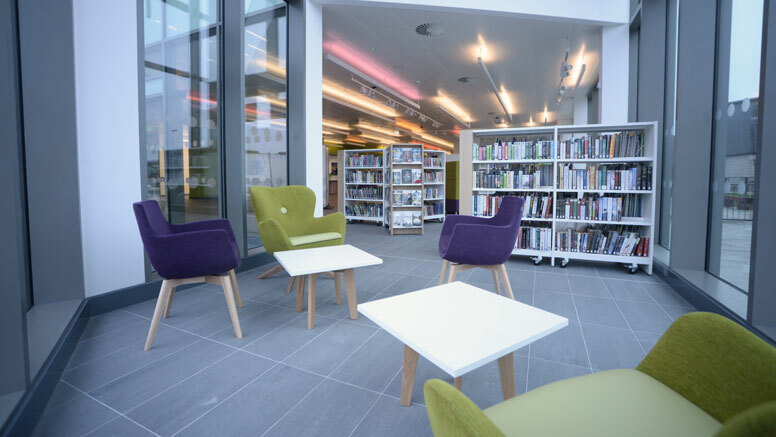 Designing Libraries spoke with John Walker of Walker Simpson Architects, and Daniela Hislop of The Design Concept, about the principles of dementia friendly design, and in particular the integration of the library into a wider wellbeing space. Great Sankey Neighbourhood Hub in Warrington aims to provide integrated facilities that include cultural, leisure and health provision to promote wellness and wellbeing. From the outset, the brief for this complex project was developed in close consultation with stakeholders and funding bodies including LiveWire, Culture Warrington, Warrington Borough Council, Sport England, Warrington Disability Partnership, Warrington CCG and Warrington Dementia Action Alliance. The project includes a small library which has its focus in the Concourse area of the building immediately accessible from the entrance lobby. This has been designed to provide both books and a digital offer with a children's library at the heart of the space. “Careful attention has been paid to the design to enable it to be dementia friendly with consideration of colour contrasts, high levels of natural and artificial lighting, acoustics, furniture and fittings, and signage,” says John Walker. The project has been developed with the University of Stirling's Dementia Services Design Centre and aims to be one of the first public buildings in the UK to gain dementia friendly accreditation. “From the outset of a design, the diagram of the building on the site should be considered. This will determine sun path, orientation and wayfinding in and around the facility. We need to consider the user experience of arrival by bus, car, cycle or walking; accessibility on foot or assisted; reception and welcome; horizontal and vertical movement; functionality, optimal adjacencies. In developing the key theme of an integrated building, the library is not confined to one location but is dispersed throughout: there are book carousels in different zones with themed titles such as Dementia and Health in the Primary Health suite, and Fitness and Activity topics in Leisure areas. There are after-school gym sessions for children and a coding club within the children’s digital area. Because the building is open from early morning to late in the evening, and the library offer is dispersed through the building, the opportunities for discovery are so much greater when integrated with a wider leisure, cultural and wellbeing public space. 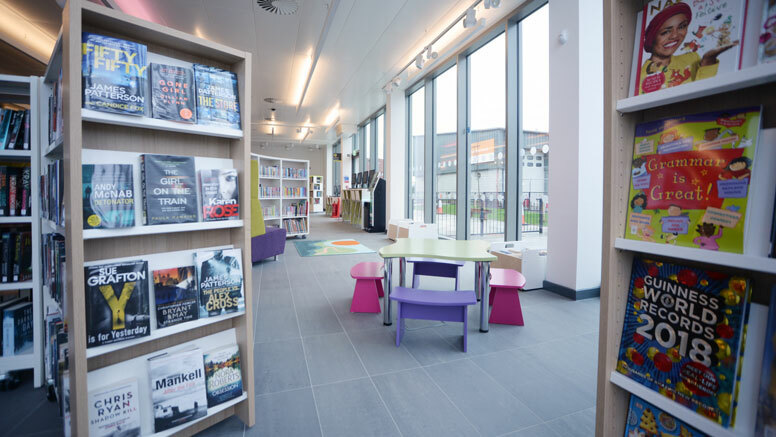 The success of the project is leading to plans for other libraries within Warrington to be refurbished with dementia friendly design features, including the South Warrington Library in Stockton Heath. Here, the proposals have been carefully developed with LiveWire and the local library group to offer community facilities with accessibility for all. Gallery of images via the Warrington Guardian.